The slopes of the pit of loneliness and despair are slick and steep. We trudge very close to them when going through deep trials, whether emotional or physical. Everyone else seems to be living his/her life to the fullest—unaffected by and unconcerned about the battle we’re fighting. Even those closest to us, go about their daily routines almost without missing a beat. They plan appointments, family gatherings, and vacations. Meanwhile, those of us in crisis find it difficult to plan our next day. If we compare our current “norm” to others or even to our previous lives, we plod ever closer to the pit’s edge. All it’ll take is a little nudge from the enemy, and we’ll slide to the bottom. But we’ve nothing to fear. We’re not alone! We have a three-strand cord tied around us with an anchor securely fastened to the Rock. SELF—that’s right I have myself. I’m stronger than I think. I have my faith. I know Scripture and trust the Author. Yet as Ecclesiastes 4:12 states, my battle overpowers me. That’s why I need the other two strands. FAMILY/FRIENDS—so many people have stood with me since my diagnosis. I can’t begin to express my gratitude and sheer amazement. 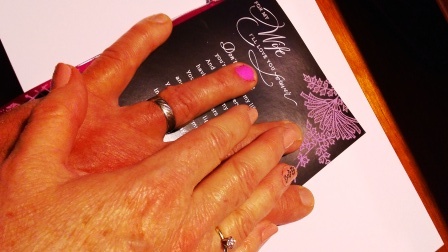 My husband agreed to paint his fingernail pink (the color for breast cancer) to show his support. He chose the nail on his wedding-ring finger. Since then, our pastor, along with countless friends and family members, has done the same. This small act of love holds me fast to the shore of hope and victory. JESUS—not only is He the third strand, He’s the Anchor and the Rock. He has secured me in His arms. He has given me a future and a promise. He has promised never to leave me ALONE nor to forsake me. All His promises are YES AND AMEN! Even when all else fails, I can count on the One Who Never Fails. My experiences of His presence in the midst of the storm confirm His presence in this one. He reveals His strength in my weakness. His grace is sufficient for me. These three strands combine to make an unbreakable cord, over which the enemy is powerless. How about you? What does your three-strand cord look like? Beautiful post straight to the heart. Keep the writing!!! God is proud of you. Thanks, Sana. As always, you are an encouragement to me. Thanks for sharing your heart. I love your “three strand cord” concept. God has used you to encourage many people over the years. Now, even through this dark trial He is continuing to use you. Thank you for your willingness. Your love for God always shines through. You are always in my prayers. Thanks, Kathy, for your encouragement and prayers.